Punctuators or Masoretic annotators; the successors of the Masorites proper. Their activity consisted in collecting and conserving Masoretic material, revising the consonantal text produced by professional scribes, and furnishing them with vowel-signs and accents as well as with Masoretic glosses. For this purpose each distinguished naḳdan provided himself with a copy of the Bible, which was generally written by himself in accordance with Masoretic rules and which became a model codex. They also produced separate Masoretic compilations or Masoretic treatises designed as manuals, and wrote works on the vowel-points and accents as well as explanations of the Masorah itself, which frequently found their way into the body of the old Masorah. 1. Abraham ha-Levi (see Zunz, "Z. G." p. 114). 2. Abraham Naḳdan (ib. p. 115). 3. Asher Naḳdan (ib. p. 114). 4. Benjamin b. Joab, called in an epigraph of 1293 (Ginsburg, "Introduction," p. 574) "Degli Mansi." 5. Berechiah b. Naṭronai Krespia ha-Naḳdan. 6. Brodmark (Zunz, l.c. p. 121). 7.Eliakim b. Asher (ib. p. 120). 8. Eliezer b. Isaiah (ib. p. 114). 9. Elijah Naḳdan, son or grandson of No. 5 in this list (ib. p. 118). 10. Gershom b. Judah, in epigraph of 1396 (Ginsburg, l.c. p. 624). 11. Ḥayyim b. Isaac, in La Rochelle, 1215-16 (Zunz, l.c. p. 110). 12. Ḥayyim b. Shneor Naḳdan, 1292 (ib. p. p. 117). 13. Hezekiah Naḳdan, the priest, second half of thirteenth century (Ginsburg, l.c. p. 480). 14. 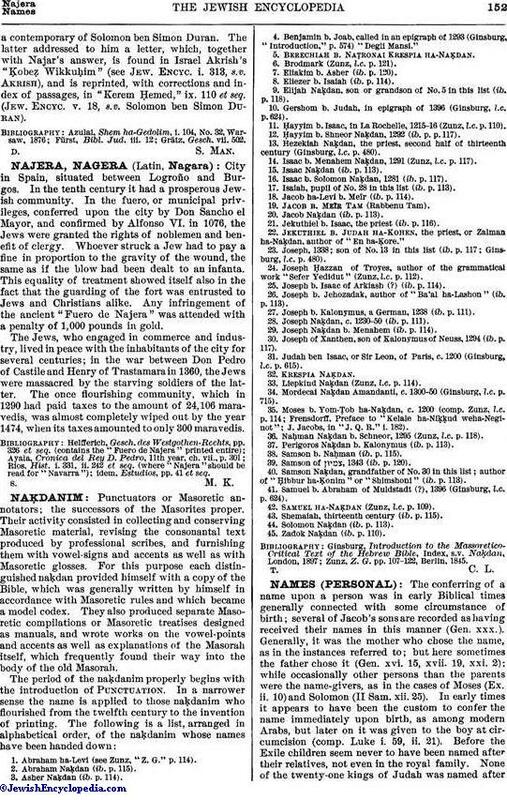 Isaac b. Menahem Naḳdan, 1291 (Zunz, l.c. p. 117). 15. Isaac Naḳdan (ib. p. 113). 16. Isaac b. Solomon Naḳdan, 1281 (ib. p. 117). 17. Isaiah, pupil of No. 28 in this list (ib. p. 113). 18. Jacob ha-Levi b. Meïr (ib. p. 114). 19. Jacob b. Meïr Tam (Rabbenu Tam). 20. Jacob Naḳdan (ib. p. 113). 21. Jekuthiel b. Isaac, the priest (ib. p. 116). 22. Jekuthiel b. Judah ha-Kohen, the priest, or Zalman ha-Naḳdan, author of "En ha-Ḳore." 23. Joseph, 1338; son of No. 13 in this list (ib. p. 117; Ginsburg, l.c. p. 480). 24. Joseph Ḥazzan of Troyes, author of the grammatical work "Sefer Yedidut" (Zunz, l.c. p. 112). 25. Joseph b. Isaac of Arkiash (?) (ib. p. 114). 26. Joseph b. Jehozadak, author of "Ba'al ha-Lashon" (ib. p. 113). 27. Joseph b. Kalonymus, a German, 1238 (ib. p. 111). 28. Joseph Naḳdan, c. 1230-50 (ib. p. 111). 29. Joseph Naḳdan b. Menahem (ib. p. 114). 30. Joseph of Xanthen, son of Kalonymus of Neuss, 1294 (ib. p. 117). 31. Judah ben Isaac, or Sir Leon, of Paris, c. 1200 (Ginsburg, l.c. p. 615). 33. Liepkind Naḳdan (Zunz, l.c. p. 114). 34. Mordecai Naḳdan Amandanti, c. 1300-50 (Ginsburg, l.c. p. 715). 35. Moses b. Yom-Ṭob ha-Naḳdan, c. 1200 (comp. Zunz, l.c. p. 114; Frensdorff, Preface to "Kelale ha-Niḳḳud weha-Neginot"; J. Jacobs, in "J. Q. R." i. 182). 36. Naḥman Naḳdan b. Schneor, 1295 (Zunz, l.c. p. 118). 37. Perigoros Naḳdan b. Kalonymus (ib. p. 113). 38. Samson b. Naḥman (ib. p. 115). 39. Samson of , 1343 (ib. p. 120). 40. Samson Naḳdan, grandfather of No. 30 in this list; author of "Ḥibbur ha-Ḳonim" or "Shimshoni" (ib. p. 113). 41. Samuel b. Abraham of Muldstadt (? ), 1396 (Ginsburg, l.c. p. 624). 42. Samuel ha-Naḳdan (Zunz, l.c. p. 109). 43. Shemaiah, thirteenth century (ib. p. 115). 44. Solomon Naḳdan (ib. p. 113). 45. Zadok Naḳdan (ib. p. 110). Zunz, Z. G. pp. 107-122, Berlin, 1845.